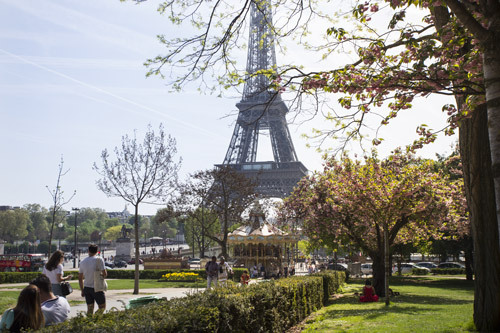 Turn your visit to the Eiffel Tower into a unique experience with a tourist guide. Jump the queues at the entrance with electronic tickets and enjoy listening to the history of this iconic building from an expert guide whilst you admire the city of Paris from on high with its stunning views that are both sensational and unique. At the time when the Eiffel Tower was built and for many years afterwards, it was the largest monument in the world. Just imagine what breath-taking views can be enjoyed from its vertiginous heights! In the present day, it has lost its title as the world's highest monument but, it has become the world's most visited and one of the most loved in Europe. Visiting this amazing feat of engineering accompanied by a guide will turn your visit into a unique experience that will fill your head and your heart with special memories to take home. It is advisable to buy the entry passes in advance. By buying this ticket, you will be able to visit the Eiffel Tower with a native guide who will make your visit to this iconic Parisian monument both fun and informative. The stories and the anecdotes that you will hear will enrich your experience and will enable you to take home some unique memories of your visit to Paris. In addition to this, once you arrive at the top of the "Iron Lady," you will be able to enjoy a view like no other in the world as you admire the famous and spectacular views across Montmartre, the famous artists' neighbourhood, the Louvre, the Arc de Triomphe and much more. So, what are you waiting for? Book now in order to secure the dates you want and forget about the queues! Select the required time and click on the icon "Book Now." On the day of your visit, just show the tickets on your smartphone at the entry and you will avoid the queues at the ticket office.